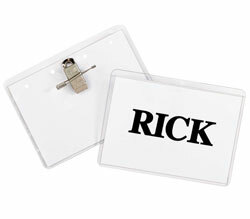 Increase security with these badges that expire overnight and identify trespassers up to 50 feet. Unique one-part badge is the easiest way yet to increase your building security. These badges expire overnight and identify trespassers up to 50 feet away. Highly visible, red VOID indicator signifies badge expiration. To activate one-part badge, simply peel badge off liner and fold tab back to underside of badge. Compatible with most direct thermal printers that can print to a 2 5/16 wide label, including DYMO, Zebra and Toshiba. Badges measure 2 x 4. 250 badges per roll.